What makes the everyday so difficult in the DPRK is its lack of accessibility, with one having to walk around with minders of the regime and a population not eager to open up to strangers; in Cuba it is perhaps the reverse: the somewhat bustling street life, the chatter, the easy intimacy so quickly established with Cubans can, however, blind one, or reveal a certain opaqueness. Cuba seems to be a place that opens itself up immediately: Cubans are talkative, love to complain and tell jokes; they are friendly, hospitable, exude great warmth; and are extremely sociable, even flirtatious. Even for a first-time visitor, after a first few hours in Cuba they feel a kind of laidback relief that in a country they have never visited or without a command of Spanish, they can feel completely at ease. The charm, the warmth, the carefree attitude can be deceitful, not because Cubans are devious or have a sinister agenda behind their friendly demeanor, but because the layers of Cuban society are manifold and friendliness is not synonymous with authenticity or truth. All societies have these layers, Communist ones perhaps add an additional one in creating what on the island is called “la doble moral” (the difference between your private and public self), beautifully alluded to in Fernando Perez’s film Life is to Whistle, where the mere saying of the expression makes people faint in the street. All societies, however, have taboos or make some distinction between public and private lives— whether pre-capitalist, capitalist, or socialist. However, Communist systems in the past have tried to minimize or even abolish that distance, particularly in the fervor of early revolutionary years, more so in the first decade after taking power. Witness the Soviet 1920s where everything was being made anew, from furniture to toys, clothes and communal dining areas, as well as the arts (especially posters). 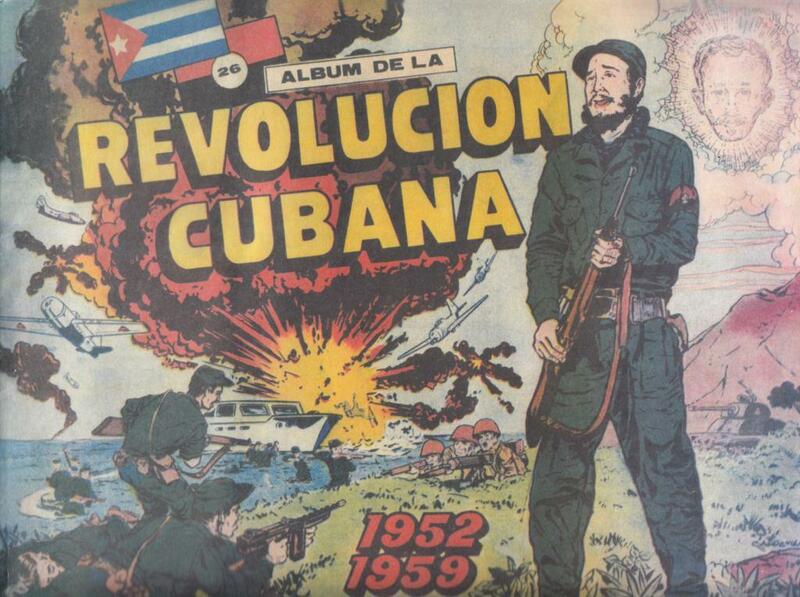 Cuba experienced a similar fervor in the sixties in terms of institutions (education, health, sports) and the arts (Cuban film posters stand out in this context), but not so much in the re-fashioning of ordinary objects. The depiction of heroes and martyrs will be a constant theme (or image) for the Cuban Revolution, its culmination being the death of Che in Bolivia and his subsequent iconic symbolic and political resurrection not only in Cuba but in Latin America and globally as well. “The Album of the Cuban Revolution” is high drama, true to Hitchcock’s dictum that “Drama is life with all the dull bits cut out.” Of course, when you are writing an epic there is no room for the dull parts; it is a heady mix of heroism, determination, sacrifice, bravery, selflessness, and, presumably, good aim. Once in power, this is usually followed by the usual monuments, statues, museums, commemorative plaques, grave sites, mausoleums, anniversaries, and other historical markers. But after all the drama and the monuments comes everyday life and the relationship between the effervescence of drama and the more, quiet elusive, ambiguous and less dramatic world of the quotidian is a vexing one that pulls us in what seem to be opposite directions. The everyday, the unfolding of hidden presences and unforeseeable futures is what Fernando Pérez so lovingly and poetically documents in his film Suite Habana (2003), perhaps a warning on how (or not) to speak about and represent everyday Cuba. Mixing a documentary approach with fictional devices (use of certain camera angles, sound overlapping into different scenes, music), he offers both individual portraits of a day in the life of Havana and a collective portrait of a city. There is virtually no dialogue in the film and no voice-over narrator. Pérez structures the characters and their daily routines around one day: getting up in the morning, having breakfast, going to work (or school), attending lunch, returning home, having dinner and enjoying evening leisure time. There are many memorable “characters” such as Francisquito, a ten-year old boy with Down’s Syndrome; Iván Carbonell, who works at a hospital and cross-dresses at night and performs in a club; Juan Carlos Roque, a doctor who also works as a clown; and Amanda Gautier, a peanut vendor who works along the Paseo del Prado. In their everyday activities we see coffee-makers, pressure cookers, the chopping of onions, people getting dressed, beds being made, TVs, people combing their hair, meals being served and eaten, the bustling rhythms of life on the streets, others in transit on foot, bicycle, or taxi (or in one case, airplane). After showing their daily routines, we find out about their dreams: Carbonell wants to perform on a grand stage; Heriberto, who plays sax, wants to be in an orchestra; Roque, the clown, wants to be an actor; Ernesto, who is fixing his mother’s house, wants to be a ballet dancer, and so on. Suite Habana’s world is as far removed from the drama of the “Album of the Revolution” as you can possibly imagine, or is it? Is the everyday fated to be “suspicious”, escaping (or accusing) forms or structures of the State, or the political, as Blanchot suggests? Are the existences depicted in the film necessarily “oblique”? Raquel, Ivan’s partner, wants to travel and return, not so easy in 2003, much more so in 2013 (though not cheap, then or now); Heriberto wants to play in an orchestra, again not impossible but there is stiff competition in being a musician in Cuba. Roque, the doctor who doubles as a clown wants to be an actor, which is entirely doable within Cuba but possibly difficult if he is starting from scratch and also being middle-aged. Ernesto, the young man fixing his mom’s house (along with Francisquito’s father) can certainly pursue a ballet career, since Cuba is a ballet powerhouse and trains many dancers, some from around the globe. Julio, the shoe repairman, nicknamed El Elegante, wants to have a different suit every night (this one is a stretch, since it implies enough money to buy several suits). Francisquito wants to scale the heights and his family (the dad, grandmother and grandfather) all express dreams of making sure the boy is cared for and not become a burden to others. Of the more than dozen people we meet, only Amanda, the peanut vendor, says “She no longer has dreams.” Many have interpreted her comment as a not so indirect condemnation of the current regime, but as a 79-year old woman clearly in her twilight years with an ailing husband, one can see her life less metaphorically as well. After all, even in “utopia” people get sick, grow old, and die. Still, the crushing sadness of her remarks sting. What is remarkable about Suite Habana is how many of the people in it show a great affinity with the arts or performance (four), but we must also include Francisquito’s grandmother who paints at night and his father, a former architect: exactly half of the twelve “characters”. Is this the director’s bias, as someone steeped in the arts, or is there something else going on here? Could this be a reflection of the Revolution’s commitment to the arts (with all its successes, failures, and continued problems) or pushback by artists who want to pursue their creativity independent of societal norms, the “suspicious agents” of Blanchot? Fernando Pérez offers no simple answers, but he does suggest that visual representation and narrative are not so transparent, even if they mutually rely on each other. With Suite Habana, Pérez has at least made the everyday a work of art, no easy feat given the subject matter. What Pérez provides that is missing from the Guttenfelder objects from North Korea is a narrative, a context. The friendship pin, was it a gift (from whom?) or did he buy it? The Hangover Chaser Tea, was that a chance encounter in a store or recommended by someone after a long night of drinking? The hedgehog toothpicks, how did he find out what they were really made of? Objects are not inert pieces of reality; they can also carry with them intimate stories with deep emotional resonance that have great meaning to people. There is a cutting board in our kitchen that belonged to my wife Ester’s grandmother Adela, from whom she inherited a fascination with food as art, nutrition, metaphor and how it intersects with history. She remembers Adela not only preparing food but telling the story of the family fleeing the Polish shtetl and avoiding the Nazis by settling in rural Matanzas. The cutting board is fairly nondescript, orange on one side, cream-colored on the other; it is used daily, mostly for chopping vegetables and fruit. The dead not only are with us and sometimes speak to us, they also help feed us, everyday. A less sympathetic view of the Pérez film would say the scenes with Francisquito (the boy with Downs) and the ending of the film with the waves crashing over the Malecón to the melody of Gonzalo Roig’s “Quiéreme Mucho” (sung by Omara Portuondo) are pure kitsch, and following Kundera, claim they are examples of Communist kitsch. Perhaps. Although an interesting critique, this is not the moment to discuss Communism and kitsch (and endless subject to be discussed in a future piece). But there are too many scenes (and persons) in the film that do not trade in on the sentimentality and fake emotion of kitsch, from Ernesto and Iván to Julio and Raquel. Earlier, I mentioned the drama of revolution followed by a period of commemoration, statues, and the like. In a country that loves to build statues, particularly of Martí (even though the most impressive one is to Maceo), the only one we see in “Suite Habana” is one of John Lennon (yes, the Beatle, not Lenin the Bolshevik). In the film he made previous to “Suite Habana”, Peréz quotes Lennon: “Life is what happens to you when you are busy making other plans.” Life is synonymous here with the everyday, what escapes the plans (an individual makes) or the Plan (that the State proposes). Cubans have, in their intense dialogue between the demands of history and the opacity of everyday existence, held true to the African roots of their culture. This is exemplified by the song “Bangán” by Pavel Urquiza and Gemma Corredera, where they invoke Elewá (Elegguá), the orisha of the crossroads. The song admirably synthesizes the dialectic between the seemingly impersonal powers of fate and the personal determination of an individual to decide (or negotiate with) that fate, day by day. The song alludes to a rooted reality that carries forth unforeseen potential, one that Blanchot expresses as follows: “For in the everyday we are neither born nor do we die: hence the weight and the enigmatic force of everyday truth.” And we might add: the everyday is where we fleetingly enact immortality and shoulder (and suffer? ), unknowingly, elusive truths. *All images scanned from El Album de la Revolución Cubana, property of the author.